LG has launched its new mid-range smartphone LG Q Stylus + in India. 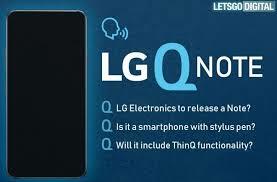 Let's say that this LG Q-series phone was launched for the first time in June. This South Korean company had introduced LG Q Stylus, LG Q Stylus + and LG Q Stylus an (alias LG Q Stylus Alpha). But only one phone has been launched in India. This smartphone comes with the stylus. LG Q Stylos + features a 6.2-inch Full vision display, Octa-core processor, 4GB RAM and 16-megapixel rear camera. It is worth noting that LG has provided information about the price and availability of Q Stylos +. When launching in South Korea, talk about providing LG Q Stylus + in different variants, which was dependent on the market. In India, this handset will come with 4 GB RAM and 64 GB storage. LG Q Stylos + will be priced at Rs 21,990. The company launched the phone in Moroccan Blue, Aurora Black and Lever Voil Color. In India, only two-color variants have been made available. The sale of the phone will start on September 5. LG Q-Stylus + smartphone will run on Android 8.1 Oreo. It has a 6.2-inch full-HD + (1080x2160 pixels) full vision display. Its aspect ratio is 18: 9 and the pixel density will be 389 pixels per inch. The octa-core chipset is used in the handset whose clock speed is 1.5 GHz. 4 GB RAM has been provided for Jugalbandi. Talk about camera setup, LG Q Stylus + handset is equipped with the 16-megapixel rear camera. This phase detection is equipped with autofocus. The front panel has an 8-megapixel camera.